(Phys.org)—Spring is a dynamic season on the dunes surrounding Mars' north pole. When frozen carbon dioxide, or dry ice, deposited as a winter ice cap on Mars sublimates – changes directly from a solid to a gas – in the spring it causes a variety of geologic changes to the Martian surface, research led by Planetary Science Institute Senior Scientist Candice Hansen has shown. The exotic phenomena associated with spring on Mars are described in three associated articles recently published in Icarus. Observations from the High Resolution Imaging Science Experiment (HiRISE) camera and the infrared spectrometer (CRISM) on the Mars Reconnaissance Orbiter have provided a rich data set that now covers three spring seasons in the northern hemisphere, Hansen said. In the winter Mars' carbon dioxide atmosphere condenses to form a seasonal CO2 – dry ice – polar cap in the northern polar region, blanketing a vast sea of dunes that encircle Mars' permanent water ice polar cap. In the spring the dry ice sublimates, or evaporates, and the gas erodes and destabilizes sand on the dunes. "It's an amazingly dynamic process," said Hansen. "We had this old paradigm that all the action on Mars was billions of years ago. Thanks to the ability to monitor changes with the Mars Reconnaissance Orbiter, one of the new paradigms is that Mars has many active processes today." Hansen is lead author of "Observations of the northern seasonal polar cap on Mars: I. Spring sublimation activity and processes," the first of three related papers published in Icarus. PSI Senior Scientist Mary Bourke is a co-author on the paper. With three years of data in hand the researchers report on the sequence and variety of changes that take place over the spring, including outbursts of gas carrying sand, polygonal cracking of the ice on the dunes, sandfalls down the slipface of the dunes, and dark fans of sand propelled out onto the ice. Gas escaping from under the seasonal layer of dry ice erodes channels in the dunes, reminiscent of the erosion that carves more permanent "spider" channels in the southern hemisphere polar region. 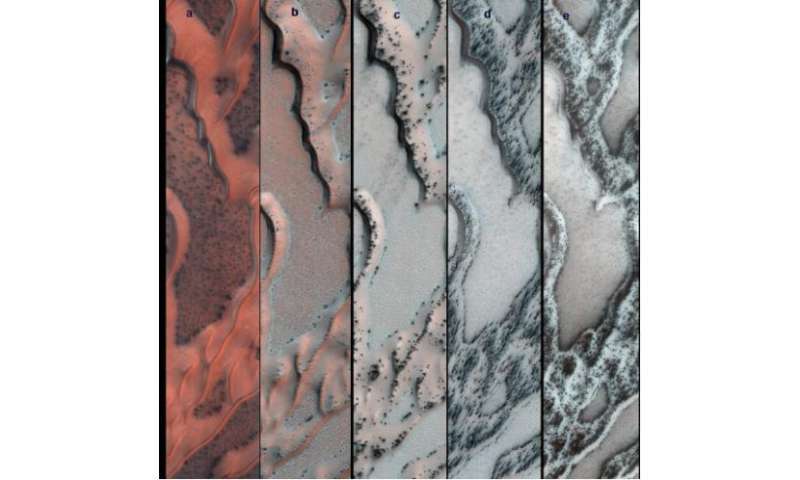 The second paper describes results from analyses of HiRISE images from a dozen different locations inside the area of northern polar shifting sand dunes. They are at similar latitudes but at various longitudes around the pole, some are inside the polar cap trough but some are not, some close to the polar cap scarp and some are far away. Despite those differences, all the locations follow similar trends during their spring sublimation phase. They all have a brightening phase, they all develop dark streaks, blotches and linear cracks in the ice and wind-modified fan deposits at similar times. CRISM data shows the variability of the composition of the seasonal polar cap in the spring, described in the third paper. Water ice frost coats the dry ice at some times. The water frost gets blown around on top of the dry ice.